When the Pentagon needed a small unmanned aircraft system (UAS) designed for both land and maritime operations, they had to be certain. When the U.S. Coast Guard's Polar Star wanted a better solution to chart the Antarctic ice ahead–and when a firefighter was lost in California's rugged coastal mountains, they too had to be certain of their choice. The same choice for them all–AeroVironment's Puma 3 AE. Capable of both ground and water landings, Puma 3 AE's innovative fuselage provides an operational flexibility never before available in the small UAS class. On the ground, Puma 3 AE is man portable. Its powerful propulsion system and aerodynamic design make launch efficient and easy. But it's in the air where Puma 3 AE quietly and effectively gets to work. Equipped with both an electro-optical (EO) and infrared (IR) camera and illuminator, Puma 3 AE keeps the operator's "eyes on target." While the precision navigation system with secondary GPS insures positional accuracy up to its 20 km range. An optional under wing transit bay easily integrates third party payloads such as communication relay, geo-location, or laser marker to meet the diverse needs of military or civilian applications. Operated from AeroVironment's battle-proven ground control station (GCS)–the same that drives our Raven and Wasp UAS platforms–the GCS allows the operator to control the aircraft manually or program it for GPS-based autonomous navigation. Puma 3 AE can deliver 3.5+ hours of flight endurance while versatile smart battery options support diverse mission requirements. A provided plug and play power adapter also makes for easy integration of extended endurance options such as solar wings. Whether it's on the battlefield or the ice field, on land or at sea, Puma 3 AE provides persistent, intelligence, surveillance, reconnaissance and targeting data (ISRT) so that our customers can proceed with certainty. This more powerful propulsion system makes the new version of the Puma 3 AE significantly more efficient and easier to launch especially in high altitudes and hotter climates. The Puma 3 AE Carries a gimbaled payload with a high-resolution electro-optical (EO) 640 x 480 infrared (IR) camera, plus illuminator. An optional under wing Transit Bay is available for easy integration of additional third party payloads such as communications relay, geo locations, or laser marker to meet the diverse needs of military or civilian applications. AeroVironment's common ground control system allows the operator to control the aircraft manually or program it for GPS-based autonomous navigation using operator-desigated waypoints. The enhanced precision navigation system with secondary GPS provides greater positional accuracy and reliability of the system. The Puma 3 AE delivers 3+ hours of flight endurance, with versatile smart battery options to support diverse mission requirements. A plug and play power adapter is provided for easy integration of futures extended endurance options such as solar and fuel cell solutions. The Puma 3 AE has been redesigned to make it more aerodynamic with rounded edges to reduce wind drag and and increase launch efficiency. Plus the fuselage is significantly stronger with a reinforced shell construction. 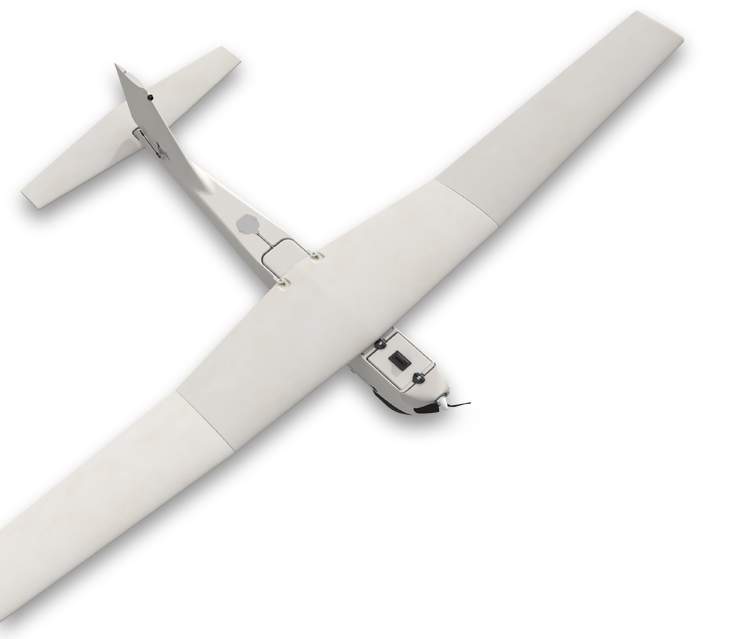 The rugged nature of this small UAS enable it to endure landing after landing thereby reducing maintenance costs.